According to the New Observer the U.S.-based Hebrew Immigration Aid Society (HIAS) has demanded that the “United States remains a place where families fleeing war and persecution can find safety and dignity”—in an article published in Israel, the Jewish state which has refused to take refugees, outlaws marriage between Jews and non-Jews, and has a Jews-only immigration policy. The HIAS is one of nine primary national contractors to resettle refugees and asylees. “Driven by our people’s shared experience of persecution and flight, and guided by over 135 years helping refugees find safety and freedom, HIAS and the American Jewish community are working together to protect and welcome refugees and asylum seekers,” Hetfield wrote. “Communities across the United States, and Jewish communities in particular, are going to great lengths to help the newest Americans,” the HIAS president continued. “Through our network of thousands of rabbis and hundreds of synagogues, we’ve seen these efforts firsthand. During the week of Thanksgiving, advocates in communities including San Diego, Philadelphia, and New York, helped refugees celebrate the holiday for the first time. 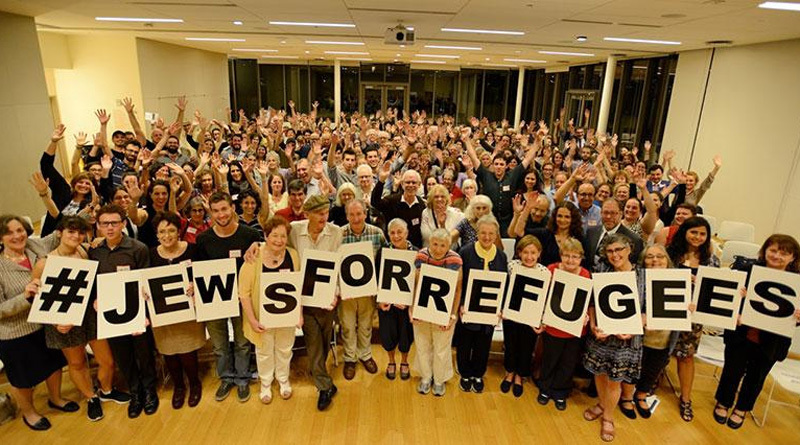 “And over the past year, local congregations around the country have volunteered to furnish apartments for newly arrived refugees, organized monthly potluck dinners, and offered language and job training. In Israel, however, there is no such “welcome” as what HIAS wants for America. In fact, the Israeli government has refused to accept any “refugees” at all from Syria, Africa, or anywhere else—and is building a new wall to keep them out. In fact, Israel has also made it illegal for any non-Jew, as racially defined by that state, to immigrate to Israel at all, no matter where they come from. At the same time, the Israeli government has also financed, through its official foreign aid section (IsraAID), the Third World Muslim invasion of Europe. HIAS’s chutzpah seems, therefore, to be in line with the already well-established practice of one law for Israel, and another law for all gentile nations. This parallels Craig Bodeker’s documentary “A Conversation About Race?” which forcefully demonstrated that there is a obvious disconnect in logic among far too many people. Irving Kristol admits that the CIA funded the neoconservative movement.